Oswego, IL, October 29, 2016 --(PR.com)-- The Bowl Elbow P/N 14330-196 is installed in Zodiac Water & Waste Aero System Assemblies, Series 14330, 15800, 38000, & 77000. The Vacuum Toilet is part of the aircraft sanitation system for in-flight and ground operations. These assemblies are installed in various Boeing, Airbus, and Embraer aircraft. 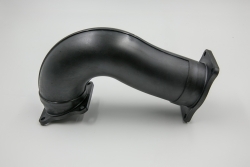 Seginus Inc has released the following FAA PMA replacement parts to aid in your cost reduction programs when maintaining your Vacuum Toilet Assemblies. There is always the possibility that Seginus Inc could create an FAA Approved Part, provided they receive a manual or other materials that show how to build it and depending on the usage per year. Seginus Inc currently has over 150 active parts in their inventory and many more are available through special order upon request. Look for Seginus Inc.'s company page on LinkedIn, email brittany@seginusinc.com to be placed on a distribution list for more information, or visit their company website.